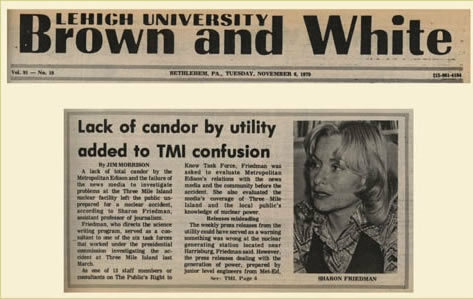 On March 28th, 1979, the U.S. had its worst nuclear power accident, as Three Mile Island Unit 2 (TMI 2) nuclear power plant near Middletown, Pa., experienced a meltdown. Sharon Friedman, an assistant professor of journalism at Lehigh, was asked to serve as a consultant to the President's Commission on the accident at Three Mile Island. She evaluated information the utility had made available to the public about its nuclear plant before the accident, and analyzed media coverage about Three Mile Island during the same period. Her work since Three Mile Island has focused on environmental reporting. From 1987 to 1989, she was a consultant to the United Nations Economic and Social Commission for Asia and the Pacific, co-authoring Reporting on the Environment: A Handbook for Journalists, which has been translated into 11 languages and is widely distributed throughout Asia, the Pacific, Russia and the Ukraine. She is currently professor and director of the Science and Environmental Writing Program in the Department of Journalism and Communication at Lehigh, and a STEPS faculty member.